on the first day it was permitted by Summorum Pontificum on September 14, 2007. I have not had as much time for blogging of late, but I have been following concerns about an instruction expected soon on Summorum Pontificum which permitted priests everywhere to celebrate Mass using the 1962 Missal. 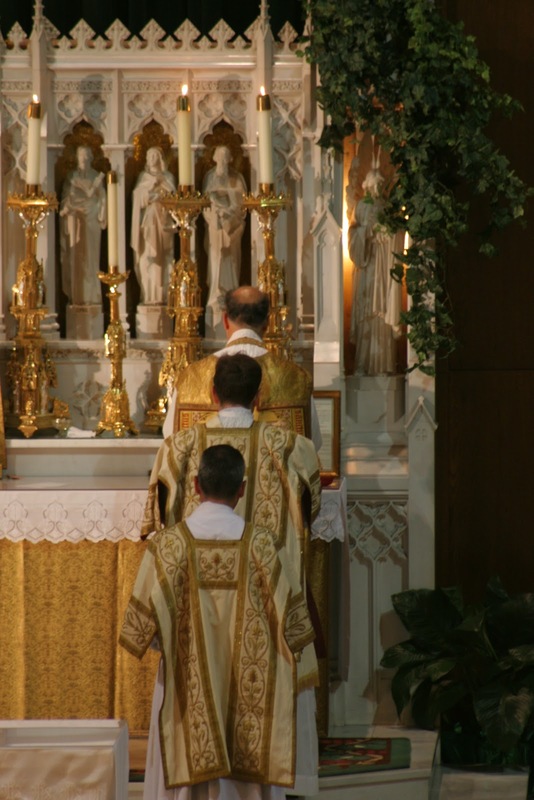 The instruction has been anticipated for some time by those devoted to the Traditional Latin Mass, but it was not expected that it would contain any kind of restrictions. I received an Inside the Vatican "News Flash" from Dr. Robert Moynihan. In it, he does a very good job of capturing what is floating out there. In the article and, at the bottom, are suggestions of what you can do. I agree with Father Z who urged people to pray and fast for the Holy Father, rather than get hysteric. There is also an online petition you can sign. Follow the link to finish reading Dr. Moynihan's letter where you will find the necessary information and links. As an aside, Inside the Vatican is one of very few publications to which I subscribe. You can subscribe to ITV too. In that same link, I recommend that you sign up for Dr. Moynihan's E-Letters/News Flashes. You can follow them on Twitter, as well @InsideVatican. Will a New Papal Document Curtail Use of the Old Mass? Will the Vatican soon issue a document calling for some restrictions on the use of the old rite of the Mass? The internet, especially in traditional Catholic circles, is abuzz with reports that this may be about to happen. But for the moment, these reports are based only on rumors. Officially, no one yet knows the content of the upcoming Vatican Instruction to give guidelines for the implementation of Summorum Pontificum -- the dramatic and controversial July 7, 2007 papal motu proprio in which Benedict XVI, after long hesitation, granted wider use of the old, pre-Vatican II liturgy, also known as the Tridentine liturgy or the Latin Mass. The upcoming document is indeed being prepared; that much is certain. It is said to bear the date of February 22 -- just four days from now. But it is not likely to be made public on February 22, but some days or weeks later, as often happens with Roman documents, and the document can even be rewritten during that time, after the date it is signed. So we may be in for a considerable period of uncertainty on this question. And that will naturally allow room for fears based on uncertain or partial information to grow. According to unconfirmed "leaks" of portions of the document's contents, the Instruction will, somewhat unexpectedly, contain two clauses which will restrict the celebration of the old rite. I say "somewhat unexpectedly" because the expectation for this document was that it would concretize what Benedict said in 2007 was his desire for a "generous" granting of permission to celebrate the old liturgy "widely." It therefore seems strange to many that, if the reports are true, it may contain new restrictions, as if this would be out of keeping with Benedict's own expressed will. The obedient are not held captive by Holy Mother Church; it is the disobedient who are held captive by the world! Note: The recommended links below are automatically generated by the tool, so they are not necessarily related content. See my post on praying for bishops, priests, seminarians, and deacons. Also learn how to spiritually adopt a bishop, priest, or seminarian. The obedient are not held captive by the Catholic Church; rather, it is the disobedient who are held captive by the world! Archbishop Vigneron - Audio/Video Archive at the Archdiocese of Detroit (click the pic). Pray for our bishops! "...the devil causes many to believe in vain visionsand false prophecies; and strives to make them presumethat God and the saints are speaking with them; and they often trust their own fancy. And the devil is also accustomed, in this state, to fill them with presumption and pride, so that they become attracted by vanity and arrogance, and allow themselves to be seen engaging in outward acts which appear holy, such as raptures and other manifestations. Thus they become bold with God, and lose holy fear, which is the key and the custodian of all the virtues; and in some of these souls so many are the falsehoods and deceits which tend to multiply, and so inveterate do they grow, that it is very doubtful if such souls will return to the pure road of virtue and true spirituality." So, is the right responsible for vitriol? A note about comments at Te Deum Laudamus! This is a personal weblog. The opinions expressed here represent my own and not necessarily those of Assumption Grotto Parish. I reserve the right to grow in my faith and will make corrections to my understandings as I recognize errors. I have added many solid Catholic resources in my blog sidebar. Please scroll to see what is available. Please feel free to comment. Comment moderation is on. Before commenting, please read my combox policy to maximize the opportunity to have your thoughts posted. Want to write to a bishop? Father Z offers some excellent tips. Whose Church is it anyway?!? Why Pray to Our Lady? Rise in Contemplative, Monastic, Cloistered vocations? Springtime in France? More like springtime in Europe! Discerning the Priesthood and Yearning for Latin in your Novus Ordo? New: Missionaries of the Gospel of Life! Is There Such a Thing as "Silent-Active Participation?" Cute: Liturgical Express - Bringing Reverence to your "Worship Space"